Bring nature indoors with our Oak Leaf Pendant Light. 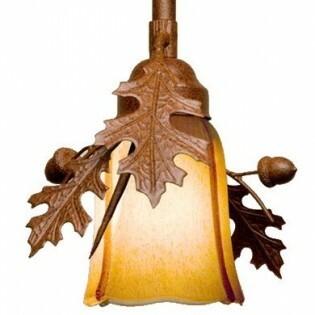 Dimensional leaves and acorns surround the mission amber glass shade for a soft glow from one 100 watt bulb. Bring nature indoors with our Oak Leaf Pendant Light. Dimensional leaves and acorns surround the mission amber glass shade for a soft glow from one 100 watt bulb. Measuring 5" this versatile pendant light adjusts in height from 8" to 38". Choose from traditional rust finish or classic black for an up scale rustic urban look.